Iian Pattinson – União da Mocidade (UDM) Musical Director and lead tutor since we were founded in 2003. Bateria director of Paraiso School of Samba, he has been to Rio de Janeiro 7 times in the past 7 years and taken part in the Carnival with well known groups including União da Ilha, Estacio de Sa, Arranco, Alegria, Caprichosos, Grande Rio, Paraiso do Tuiuti, Porto da Pedra, Sao Clemente,and Viradouro. 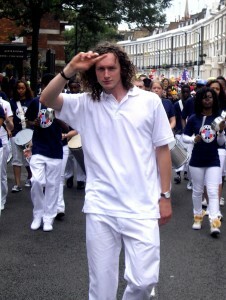 He has played a drums since the age of 6 and has 15 years of experience teaching drumkit and samba in schools. He is also a visiting lecturer/tutor in Brazilian and Latin American Music at the Royal Academy of Music, Middlesex University and Tech School. During his performing career he has also worked in TV, theatre and numerous jazz, Cuban, Caribbean and Brazilian MPB bands. Tamara Arom-Hobbs – UDM tutor, director and project manager since we were founded in 2003. Tammy has been performing samba since 1999 when she was one of the founding members of Rhythms of the City. 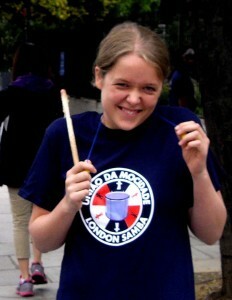 She has also been performing with Paraiso School of Samba as both a percussionist dancer since 2005. Originally an orchestral cellist and also a Steel Pannist, Tamara went on to study ethnomusicology. She has travelled to Rio de Janeiro 5 times in the past six years and performed with União da Ilha, Estacio de Sa and Arranco and also with numerous bands in the UK. She has over 10 years of experience teaching samba, steel pans and African music and dance in schools, and has worked with Creative Partnerships on various whole school carnival projects where creative thinking is placed at the centre of learning and academic subjects are taught through costume design, music, dance and story. She also makes and sells her own samba costumes. 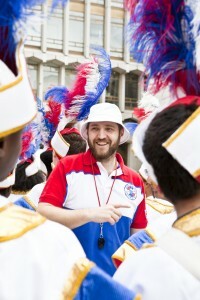 Matthew Watson – UDM tutor and director since 2010, Matt is Head of Music at Mossbourne Community Academy, Hackney. He has been playing drums since he was 10 years old and has taught and performed all around the UK. 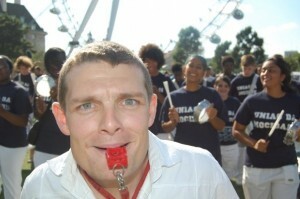 He is also a director of the bateria at Paraiso School of Samba. John Campbell – UDM tutor and apprentice director. John is one of the earliest members of UDM, now only 20 he is one of the youngest members of the UK samba scene to have trained in samba to high level from childhood under the tutelage of Iian Pattinson who has taught him drums and percussion since he was 11. John is a graduate of Fine Art from Camberwell College and as well as playing in Paraiso, he is involved in the creation and development of Paraiso’s floats. Kellie Harvey – UDM dance tutor. Kellie has trained in several major London dance institutions including SELTEC(Lewisham college), Laban and London School of Contemporary Dance(The Place). An extremely versatile performer and choreographer she is trained in ballet, jazz, Matt Mattox jazz, contemporary dance and freestyle. 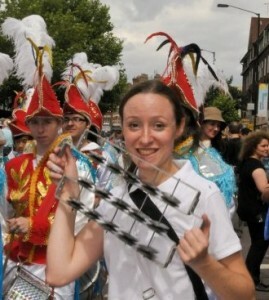 Kellie has been dancing samba since 2010 and is the 2012/13 Queen of the bateria (drums). She also dances in several professional samba companies and performed in the Brazilian Olympic Flaghandover ceremony in 2012. Leila Heinel – UDM Assistant dance tutor. Leila has 7 years experience in performing samba and Latin dance shows in London and Internationally. Having trained with Paraiso School of Samba where she won the ‘Rainha da Bateria’ competition in 2010, she has performed in the Rio de Janeiro carnival twice, with ‘Uniao da Ilha’ and also teaches all levels of samba to adults and children. She performs with Paraiso School of Samba, Oi Brasil, Brazilian Fantasy and danced with the Brazilian Olympic Flag handover team.